I had to write a paper on Once for my European Cinema class while in London. I thought it gave a unique perspective on the play and will hopefully give you a better sense of what Once is about as well as bring up difficult topics that you may want to consider if you see the play! This does contain SPOILERS!!! 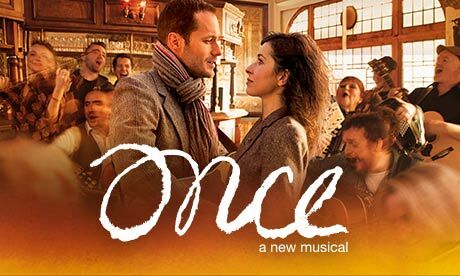 “Once is by far one of the best musicals currently being performed on the West End. The musical centers around a Czech girl and an Irish guy who meet, bond over their passion for music, fall in love and sadly separate all within the course of a two-hour show. Once resembles many of the films we’ve watched in our European Cinema class as the theme of immigration is presented. However, immigration is handled much differently in Once in comparison to the films viewed in our European Cinema class. One of the main differences in the musical is the fact that the immigrant is helping the native. This is much different from the films we viewed in class because typically the native assists the immigrant and the immigrant is typically seen as the weak character. However in Once, Girl is the one with connections and has her life together, while Guy has no goals, dreams or desires. Girl is the one who sets up a loan for Guy and she is the one who sets up a recording studio slot for Guy. Girl has more control of her life than Guy. Once is an interesting tale because it begins with the Czech girl having already established herself in Ireland as an immigrant and in the end, Guy also becomes an immigrant as he moves to New York. As Once is a light-hearted tale, it does not dwell much on the problems of mobility. Guy easily leaves to pursue his love interest with the help of his father; and Guy and Girl are easily able to receive loans from the bank. This contrasts to the struggles of mobility presented in the films viewed in our European Cinema class, where many lives were lost during the immigration process. Another interesting aspect of Once is everyone is very protective of Girl. There appears to be no real barriers for her. Although she is a young mother whose husband has abandoned her, the people of Ireland accept her much more than what is illustrated in other films, besides stereotyping her as always being serious… Because she is Czech! (Actually she is the most optimistic! Well until Guy falls in love with Girl and wants her to run away with him).